Hi Guard Boot High X-Large Shoe Covers from Halyard Health are knee high disposable shoe covers with two inch foam traction strips on the sole for stability. They are designed for potential heavy fluid contamination. 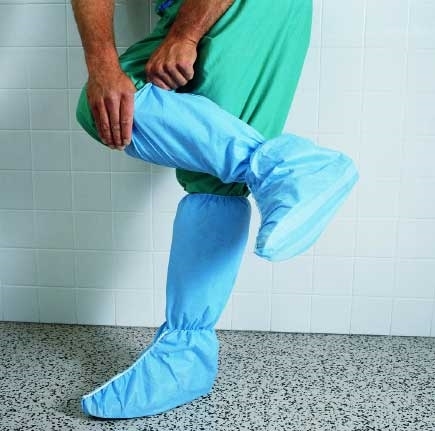 Hi Guard Boot High X-Large Shoe Covers are for use with larger sized shoes. They are made of a 3 layers of fabric that is coated at the foot with a plastic film. They are nonsterile, disposable, and for single use only. Formerly known as Kimberly Clark Hi Guard Boot High X-Large Shoe Covers. Kimberly Clark Health Care products are now Halyard Health products. The name has changed, but they are the same great products with the same dependable quality. The transition on these products will occur over the next 24 months. These changes include new packaging and product branding. During the transition you may receive packaging with Kimberly Clark or Halyard Health on the label. Visit www.HalyardHealth.com for more information.